The Mountain Buggy Nano Grab Bar Set includes a bumper bar and food tray for your Mountain Buggy Nano Pushchair. The food tray is dishwasher safe and can hold up to 2kg. The Mountain Buggy Nano Grab Bar Set is the perfect addition to your Nano pushchair this summer. The Mountain Buggy Nano Grab Bar Set includes a bumper bar and food tray for your Nano Pushchair. It is ideal for summer months as it allows your baby to snack in style and comfort whilst out and about. The Mountain Buggy Nano V2 Pushchair is the compact, lightweight and yet still super-stylish pushchair being offered up as the perfect travel transport solution for your little twiglets. Weighing just 5.9kg and measuring only 22 inches wide, the Nano V2 really is the ideal pushchair to take with you on that long-haul flight or to tuck neatly away in the boot of your car for your summer camping trip to the lakes. Not only does the Mountain Buggy Nano V2 promise longevity and convenience, but it also comes with its own custom-fit travel bag to make carrying and travelling with the Nano V2 easier than ever. No more huffing and puffing as you struggle to pack and repack, desperately trying to make room for the last suitcase because “the blooming pushchair is taking up all the room!” Make holidays a breeze with this fuss-free option! Why should I buy the Mountain Buggy Nano V2 Travel Stroller? The Nano V2 Travel Stroller by Mountain Buggy is suitable to use with bubba from 6 months to 4 years (20kg), or from birth in lie flat mode with the use of a Mountain Buggy Soft Shell Cocoon Carrycot (sold separately). The Mountain Buggy Nano V2 Travel Stroller has an easy pack down/2-step fold mechanism - you simply have to press 2 buttons and the buggy folds into itself and perfectly fits into the custom-fit travel bag. Use the comfortable shoulder strap to carry it with ease, leaving your hands free to keep hold of the troublesome tiger. To unfold - simply hold the handle and flick the buggy out - it will unfold in an instant. Everyone loves simplicity, don’t they?! For those warmer mediterranean days when the sun is beaming down on you, use the integrated sun canopy with sun visor which simply flicks out in a jiffy. The Mountain Buggy Nano V2 Pushchair gives you the option to either lock the front wheels or set on full swivel mode so that you can manoeuvre your small person around the busy streets of suburbia. The puncture-proof 4 x 6” EVA tyres are hardy and with rear wheel suspension, the Mountain Buggy Nano V2 Pushchair can cope with any gravel, shingle or cobbled terrain you throw at it. There is an easy pedal brake keeping everything as simple and practical as possible. The Nano V2 has easy-clean fabric and a mesh back (when seat is in recline) which allows for better ventilation and air flow. The fabric extension overlay is great for winter. The Mountain Buggy Nano V2 pushchair has outstanding kerb pop abilities and is fully compatible with the Mountain Buggy Freerider (sold separately). With built-in safety belts and on-board car seat adaptors, you can safely secure an infant, making it easy to transform your pushchair into a travel system. 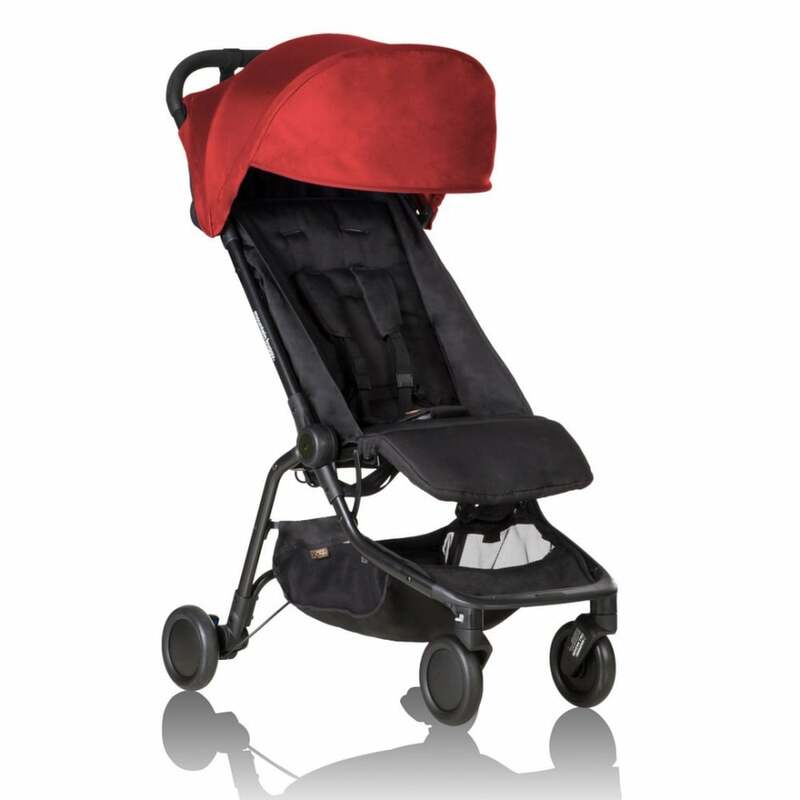 The Mountain Buggy Nano V2 Pushchair has a maximum load of 20kg (44lbs) and measures 100cm (h) x 56cm (w) x 84cm (d). The rear tray has a maximum load of 5kg (11lbs). 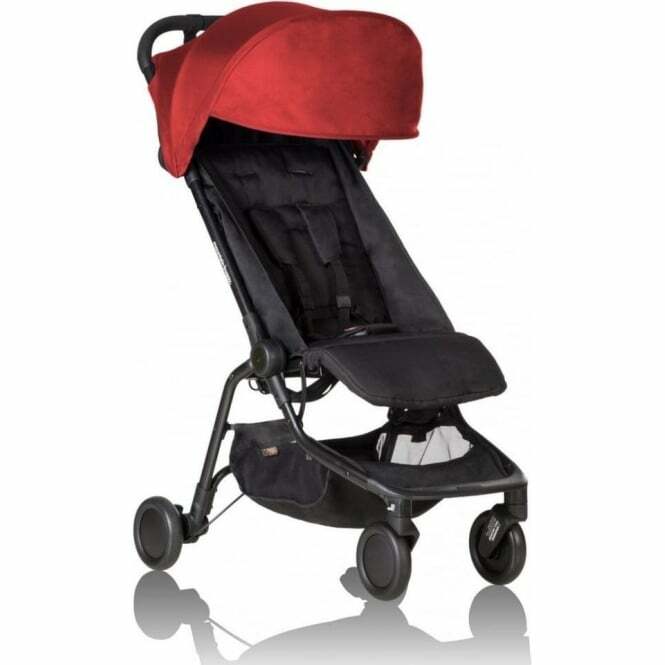 Showing our 7 Mountain Buggy Nano V2 Pushchair reviews with an average rating of Excellent. Would you like to write a review? Your Review - Wish I bought it sooner! Your Review - Best pushchair I’ve purchased. I purchased the blue nano and I’m so happy with it. It was my first purchase from buggybaby and delivery was the next day via ups. My son who’s 19months loves it. I’ve used the chair for over two weeks since my order from the school run to shopping and a half term holiday at the coast. And I can say it’s the best one I’ve had so far and will be the last one too. I also love that it collapses super small and I can carry it on my shoulder to which helps with a two children. Your Review - Great product and easy to put together. Took it away with us on holiday and was the perfect buggy for travelling!! It's compact and light but very sturdy when opened up, would be happy with both 11month old and 2 and a half year old in it. I have also found a buggy board which fits it so I can finally sell my double buggy and have this great one only!! Would recommend to anyone. Super easy to fold, take on the school run and get out in the car (really small in our car boot). Would recommend to any family. We live in a two bedroom flat in the centre of a town, and the Nano seemed like the only buggy which we could add a car seat too and at a reasonable price. We'd certainly recommend it, such a space saver and it's very easy to push. We purchased this solely for taking on holiday, however since using it every day for a week abroad we have since used it every day at home. It's very light and really easy to open and fold up, I couldn't now imagine life without it.